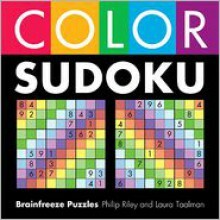 Sudoku fans will welcome this bright new twist to the popular puzzles! Every one of these ingenious creations—from “Bold X” to “Rainbow Up”—makes colors and patterns part of the solving fun. And although each puzzle maintains the normal 9x9 grid and follows the basic rules of the game, every style adds an additional restriction to intensify the challenge. In “Worms,” for example, swirly, squirmy shapes fill the grids; the numbers increase as you work your way from head to tail. “Even/Odd” features squares in two colors, depending on whether the number to fill it is even or odd. And in “Positional Board,” no two of the red squares can be the same number. They’re all lots of fun!